It’s no secret that Chicago is riddled with empty spaces and abandoned properties. According to one recent estimate, the city may contain as many as 50,000 public and private vacant lots. But these days, there’s a growing movement to use these spaces for something more. Scattered across the city, small, organic community-run gardens are bringing neighbors together while also bringing them down to earth. Real estate developer David Brown owns one such garden, called Montrose Green, nestled right under the Montrose Brown Line. Eventually, Brown plans to develop this space into a mix of retail, commercial and residential property. But in the interim, he’s passed the land over to the Peterson Garden Project, a volunteer-run nonprofit whose mission is to teach people how to grow their own food. Andrew Karl shares a plot with his girlfriend. For Karl, a Nebraska native, the plot is a way for the two to connect with their rural roots. The soil at Montrose Green – like all the gardens run by the Peterson Garden Project – is trucked in from organic suppliers, making the actual quality of the land irrelevant. For a small fee – $65 per growing season – community members can garden a small plot raised off the ground. Gardeners have creative license to grow whatever they want, though there are a few rules: no pesticides or herbicides, including Miracle-Gro; no pets, who might dig up a neighbor’s hard-won kale; and no non-edible plants, no matter how pretty the flower. For some, community gardens are extensions of their religious faith. 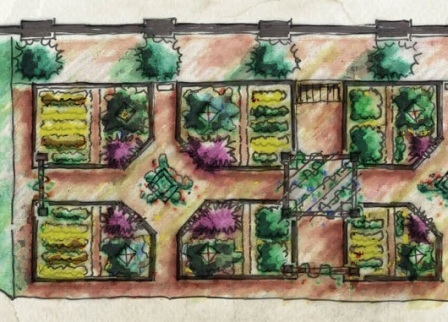 Take Anne LaForti, who helped found a garden in Rogers Park called The Gan Project. Gan means “garden” in Hebrew. The Gan Project serves a unique function in the Jewish community, LaForti says, since observant families in Rogers Park can only shop at a finite number of Kosher food stores. For those who want to buy local, these stores don’t always satisfy. And prices in this niche market are often out of reach for large families on tight budgets. Tara O’Connor tends her own plot at a community garden in Edgewater, cheekily called Vedgewater. The space is also run by the Peterson Garden Project, which borrowed the land temporarily from Loyola University. Raised in upstate New York, O’Connor moved to Chicago last September with only a vague sense of what life here would look like. “I was sort of hesitant to come because I didn’t think there was going to be an opportunity to be around nature,” O’Connor said. The story behind the most colorful plot in this garden is a surprisingly dark one. Edgewater resident Leonard Lauricella comes once, twice, sometimes three times a day to tend to his vegetables. That’s because his garden plot is dedicated to his grandson, who died in February after a one-year battle with a brain tumor. Jake was 7 years old. “This garden represents his spirit, his fight to live, his smile,” Lauricella said, a bracelet with Jake’s name dangling from his wrist. All the vegetables he grows are donated to Care For Real, a food pantry in Edgewater. For Lauricella, these daily visits are about something much bigger than simply gardening. A living, breathing, blossoming memorial to a boy who didn’t make it to his first communion. Kept going by a grandfather who sees a deeper meaning to it all. Watch Chicago Tonight at 7:00 pm to see these community gardens for yourself.